Behind every world-class athlete, championship team or outstanding musician, there lies a great coach. Breakthrough business success works the same way. Peak Performance Coaching helps you build new business muscle with insights, training and skills that allow you and your company to perform at your highest potential. It’s easy for senior managers to reach a plateau in their leadership abilities and career climb. We’ll challenge you to grow and improve. Get more from your employees by getting more from their managers. 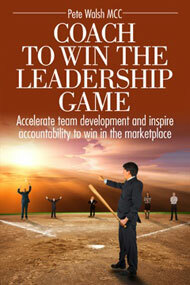 We’ll identify and exercise those attitudes and behaviors that personify great leadership. Blood and business can be an incredibly successful combination. Our coaching and techniques will help ensure that you don’t sacrifice one for the other. Improve your personal effectiveness with the proven principles used by world-class athletes. We’ll help you stretch beyond your current capacity.